The emblem of the San Diego and Arizona Railway, introduced in 1922. The San Diego and Arizona Railway (AAR reporting mark SDA) was a short line, standard gauge American railroad founded by "sugar heir," developer, and entrepreneur John D. Spreckels, and dubbed "The Impossible Railroad" by many engineers of its day due to the immense logistical challenges involved. Established in part to provide the City of San Diego, California with a direct transcontinental rail link to the east by connecting with the Southern Pacific Railroad (which secretly provided the funding for the endeavor) lines in El Centro, the 146-mile (236-kilometer) route of the SD&A originated in San Diego, and terminated in the Imperial County town of Calexico. The company charter was executed on December 14, 1906 and the groundbreaking ceremony was held on the following September. Numerous delays (including government intervention during World War I) delayed the completion of the line to November 15, 1919. Completing the SD&A was a monumental task that seriously affected Spreckels' health, and in the end nearly cost him his life. Damage to the lines from both natural disasters and sabotage exerted great financial pressure on the company, and in 1932 Spreckels' heirs sold their interests in the railroad (which was thereafter named the San Diego and Arizona Eastern Railway) to the Southern Pacific. The company was chartered on December 14, 1906 with John D. Spreckels as chairman. Southern Pacific Railroad (SP) president Edward H. Harriman agreed to surreptitiously provide financial backing for the effort as part of that company's bid to establish a direct link between San Diego, California and the Eastern United States (in order to compete with the Atchison, Topeka and Santa Fe Railway's "Surf Line" route which had located its western terminus in National City). When Harriman unexpectedly passed away on September 9, 1909 the SP's "era of expansion" came to an end, and funding for the SD&A abruptly ceased. Groundbreaking ceremonies were held at the intersection of San Diego's Main and 18th Streets on September 7, 1907. Spreckels raised the additional money required to complete the railroad on is own. Construction delays, attacks by Mexican revolutionaries, and government intervention during World War I all served to push the construction completion to November 15, 1919 when the "golden spike" was finally driven near Jacumba by none other than Spreckels himself. 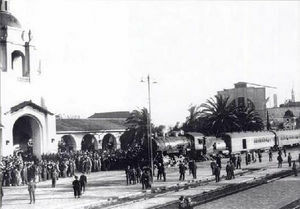 The first through SD&A passenger train left San Diego on the morning of December 30, and made the full run from El Centro to San Diego's downtown Union Station for the official opening of the line the next day, December 1, 1919. The total construction cost of the 146.4 miles (235.6 kilometers) of track laid was approximately $18 million, or roughly $123,000 per mile ($76,500 per kilometer); the original estimate was $6 million. The 11-mile (18-kilometer) long segment through Carriso Gorge  (which included 13,385 feet (4,080 meters) of tunnels, 17 in all) alone cost over $4 million to construct; the 3 miles (5 kilometers) of tunnels (21 total) along the entire line ran another $1.8 million. Almost 2½ miles (4 kilometers) of bridges and trestles were built as well. The tracks departed downtown San Diego south where they crossed the U.S.—Mexico border at San Ysidro. From there the line traversed eastward through Tijuana, then headed northeast through Tecate and back over the border to the town of Campo. A 1919 route map of the San Diego and Arizona Railway. To construct and maintain the 44-mile (72-kilometer) stretch through Mexico the SD&A formed the Ferrocarril Tijuana y Tecate, S.A. de C.V. (Tijuana and Tecate Railway Company), at the behest of the Mexican government. East of Campo the road traveled through Clover Flats, across the Coast Range (elevation 3,660 feet), then descended through the breathtaking but treacherous Carriso Gorge, the builders' most significant obstacle. Though the SD&A line ended in Seeley, trackage rights gave the railroad the ability to run trains as far east as El Centro and as far south as Calexico. Branch lines ran from downtown to as far north and east as the community of Lakeside, with a separate line which circumvented San Diego Bay to service Coronado Heights, Coronado, and North Island. The line provided both passenger and freight service for several decades. Long distance passengers on the SD&A were required to pass through two border check points, and were often subjected to severe dust and heat over much of the route. Damage to the lines from heavy rainstorms, landslides, and fires took a financial toll on the railroad, as did border closings with Mexico. Clashes with the Industrial Workers of the World (IWW) resulted in acts of vandalism as well. In 1932, financial difficulties forced Spreckels' heirs to sell their interests in the firm for $2.8 million to the Southern Pacific, which renamed the line the San Diego and Arizona Eastern Railway (SD&AE). 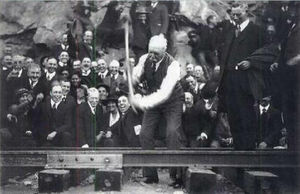 John D. Spreckels drives the "golden spike" to ceremonially complete his San Diego and Arizona Railway on November 15, 1919. The spike, reported to have cost $286, bore the following inscriptions: "Spike driven, by John D. Spreckels, President." and "Last spike driven, San Diego & Arizona Railway, in Carriso Gorge - November 15, 1919." The first SD&A passenger train prepares to make its way to San Diego on December 1, 1919. The first San Diego and Arizona Railway through passenger train, No. X2708, arrives at San Diego's Union Station passenger terminal on December 1, 1919 to officially open the line. "Drumhead" logo signs such as this often adorned the ends of SD&A passenger trains. 1873: The Texas and Pacific Railroad (T&P) fails in its attempt to establish a direct rail link between San Diego and the East during the "Panic of 1873." 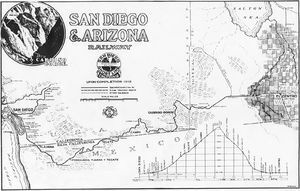 1905: The San Diego and Eastern Railroad (SD&E) conducts a survey for a planned rail line to Arizona but folds prior to commencing track laying. December 14, 1906: John D. Spreckels announces he will form the San Diego and Arizona Railway Company and build a 146-mile line between San Diego and El Centro. Spreckels has an agreement with the Southern Pacific Railroad (SP) to silently fund the project (ironically, Spreckels later became an outspoken critic of the Southern Pacific Railroad and their monopolistic practices, and often used his newspaper interests as a platform to denounce the company and its officers). September 7, 1907: Groundbreaking ceremonies for the SD&A are held in downtown San Diego at the foot of 26th Street (now known as Dewey Street) and Main Street. San Diego Mayor John F. Forward, Sr. turned the first shovelful of dirt in place of Spreckels, who was unable to attend. The line will follow in part the route surveyed by the defunct SD&E. 1909: The Mexican Government orders the SD&A to form the Tijuana and Tecate Railway Company, which will construct and hold a 99-year lease on the 44-mile Mexican rail segment. 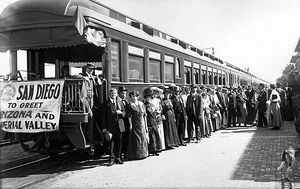 July 29, 1910: The first passenger train on the SD&A enters Mexico. 1911: Mexican revolutionaries mount several attacks on the SD&A construction crews to conscript soldiers and supplies, and cut telephone wires. 1916: The "Great Flood" washes out several rail lines. World War I increases the cost of railway construction materials by 50 to 150 percent. 1917: The U.S. federal government seizes control of all railroads and stops construction of the SD&A as part of its war effort to conserve resources, but later grants Spreckels special exemption on the grounds the SD&A will serve a military installation. The SD&A absorbs the struggling San Diego and Southeastern Railway (SDSR), assuming operation of the company's steam divisions and gas-electric motor cars. Spreckels' San Diego Electric Railway (SDERy) continues to operate the interurban line to Chula Vista under lease. The remaining SDSR tracks not damaged in the previous year's flooding function as a "bridge" line between the SD&A and SDERy, which allows for the interchange of freight traffic. At this juncture Spreckels owned all the trackage in San Diego County save for that owned by Santa Fe. November 15, 1919: The "golden spike" is driven and construction of the SD&A is completed at a cost of $18 million (three times the original estimate). December 1, 1919: The first through passenger train "arrives" in San Diego from El Centro for the official line opening ceremony. December 2, 1919: The first through-service freight train departs San Diego. December 10, 1919: Through Pullman service to Chicago is initiated; the cars are switched to the Southern Pacific's Golden State passenger train in Yuma. 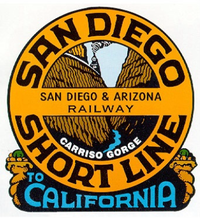 1922: A new emblem, depicting a scene in the Carriso Gorge and lettered "San Diego Short Line" is adopted. June 7, 1926: Spreckels passes away at the age of 72. 1926, 1927, and 1929: Heavy rains take out large sections of trackage east of San Diego. 1928: Motor service to La Mesa and Lakeside is discontinued. Paramount Pictures produces the motion picture Beggars of Life starring Wallace Beery (the studio's first feature with spoken words); filming of the climactic scene over the Carriso Gorge involved an actual derailment using SD&A locomotive No. 104 and a private SD&A passenger car. January 1932: Fire breaks out in Tunnel 3 in Baja California, which leads to a collapse. Repairs take 45 days. March 27, 1932: A huge mountain slide, loosened by heavy rains, blocks the line in the vicinity of Tunnel 15. Repairs are completed and freight and passenger services are re-established on July 6 and 7. October 22, 1932: Tunnel 7 burns and is subsequently abandoned. October 24, 1932: Financial problems force Spreckels' heirs to transfer their share of SD&A ownership to the Southern Pacific Transportation Company for $2.8 million. January 23, 1933: A bypass track along the cliff at Tunnel 7 is completed and the line is reopened to traffic. February 1, 1933: The San Diego and Arizona Eastern Railway (SD&AE) is incorporated and assumes all operations of the SD&A. December 1985: The Pacific Southwest Railway Museum revives the historic San Diego and Arizona Railway name (reporting mark SDAX), inaugurating its own Golden State demonstration passenger trains over the railway out of Campo, east to Miller Creek and west to Division and tunnel four at the international border. ↑ Smythe, p. 533: "...they [the articles of incorporation] were not filed with the county clerk until six months later." ↑ Yenne, p. 74: Spreckels, had, in effect, been acting as the SP's agent in this regard. ↑ Dodge, p. 66: The SP subsequently filed a lawsuit against the SD&A to recover the monies already advanced; the SP's final demurrer in the matter was thrown out of court. ↑ Hanft, p. 76: Sometimes spelled "Carrizo." ↑ Price: In time, the road's patrons dubbed the SD&A as "Slow, Dirty, and Aggravating." ↑ Kimball: "Spreckels made a short speech from a flat car, jumped down, stripped off his coat and drove the final spike. A thousand spectators observed." ↑ Hanft, p. 80: The special was headed by Southern Pacific locomotive No. 2708, a "Consolidation Class" C-8 2-8-0 built by Baldwin / Schenectady under lease to the SD&A. ↑ Beggars of Life (1928). American Film Institute. Retrieved on 17 November 2013. This page was last modified 07:40, 17 November 2013.